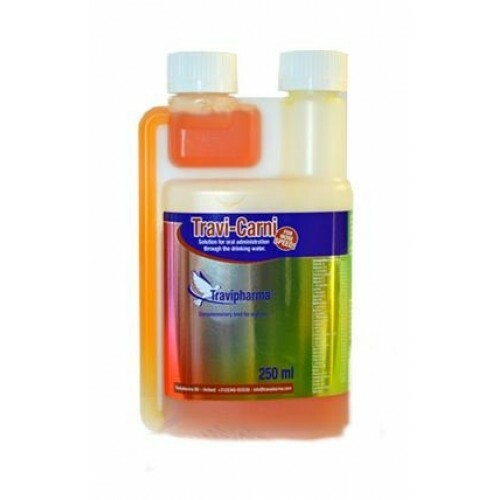 Travi-Carni 250ml by Travipharma is a nutritional supplement for pigeons with L-carnitine, enriched with vitamins and amino acids to improve performance during the racing season. L-carnitine supplies energy producers additional power supply body to produce more energy and help prevent lactic acid in the muscles. - Provides additional energy to the body. - Reduce the accumulation of lactic acid in the muscles, preventing muscle aches. - More and better milk production in the crop. For oral administration through drinking water. 1 measure (10 ml) of Carmine per litre of drinking water. - Short distance: during 3 days before basketing. - Middle distance: during 4 days before basketing. - Long distance: during 7 days before basketing. Fresh water should always be available on the day of basketing.